MY NAME IS ALLY PINTUCCI. I WANT TO INSPIRE PEOPLE TO MOVE. I want to post a picture and have people say "I NEED TO GO HERE", no matter where it is in the world. I want to spark excitement. I want to spark some life. And then there's you, the facilitator; the end destination..or as the kids would say the "#LifeGoals". You have something special that lights the spark in the eyes...and the soul. You have access to more than just a place, you have created a life changing experience. ..and that's exactly why we should work together. I've built an engaging following that emotionally connects with what I do. I've done that through powerful visual and written content that builds relationships and trust. "Ok, this is amazing. Where is this place? "I need to go here"
"Whoa. This is officially on my bucket list"
My authenticity creates the spark. THINK THE GREAT ESCAPE, BUT FOR EVERYDAY PEOPLE. Sure, it sounds amazing to quit your job and buy an around the world ticket but that's not reality for most people who fantasize about exploring the planet. I want to promote trips that people dream about. Trips that people can actually see themselves doing in the near future. A luxury escape is possible for anyone who takes the time up to save for it. 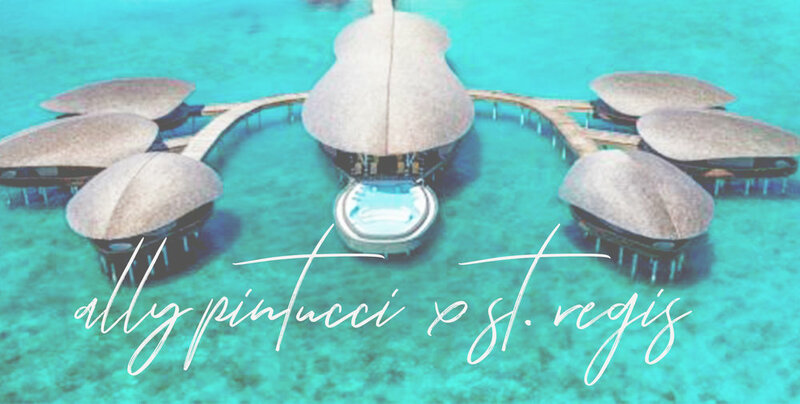 Let's get the St.Regis to the top of everyone's bucketlist. I'll showcase the most perfect escape...and you just have to stand there and look pretty. I want to work together to plan out a stay that creates an exiting experience and moments worth sharing. featured in the blog/hotel promotions. *based on double occupancy. The travel companion helps as subject in photos/content. The ask and gives are flexible and open for discussion. I'd love to hear your feedback and work together on something that creates an exiting partnership and new relationship!